Nine days and eight nights of music, fun, learning and friendship in Cuba. Want to stay longer? We make it happen for you at cost. Go for it! Euphonium player. Click to enlarge. Attend the gala opening and closing ceremonies of the Jazz Festival and all events in between on a deluxe Gold Access Jazz Fest Pass. An up close highly personal examination of Cuba's renowned music and arts scene, and a big dose of authentic island culture. Be part of the daily life of Cubans in La Habana and Artemisa provinces. Encounter a neighbor nation and kind people forbidden to Americans since 1959. Glean insights into dynamic citizen engagement in all aspects of urban and rural development and national policy. Establish enduring personal and professional relationships with your Cuban counterparts and North American tourmates. GOLD ACCESS Havana Jazz Festival Pass for every tour participant. This premium credential grants the bearer access to all jazz festival venues from December 20 to 23. SAFE, FUN, people-to-people cultural travel. Your tour is fully escorted by Cuban experts from the minute you land in Havana until you go home. You're in the conscientious care of our fulltime multilingual guide together with a professional bus chauffeur. They're there for you and eager to assist in everyway. MANDATORY Cuban medical insurance is included in tour cost. This excellent policy covers all health issues that may arise while in Cuba. If you get hurt or take ill, you are not dinged with out-of-pocket expenses. WE ENSURE Americans travel to Cuba legally. Find out how you can go to Cuba now. We've sent thousand of Americans to Cuba since 1997. Not one has experienced complications. We assist free of charge with all licensing issues so you can go to Cuba legally without fear or concern. TRAVEL FOR CHANGE Cuba Education and Explorer Tours is an American, Canadian and Cuban based organization dedicated to green, ethical social travel that benefits Cubans and our guests. BEST RESTAURANTS Every traveler gets an exclusive Havana's Best Restaurants guide highlighting cuisines for every taste and budget. It's updated monthly based upon reviews from our travelers: places they found to be most delicious and service friendly. It features everything from street eats to elegant culinary encounters. CLUB CUBANO benefits apply to this tour. Club Cubano's no-obligation free membership means cash rewards, big discounts and no-cost travel. Become a Cuba Education and Explorer Tour travel agent and start generating income – even if you're not able to go to Cuba now. CUBA TRAVELER GUIDE Every tour participant receives a Most Amazing and Fun Things to Do and See in Havana brochure. It begins with free activities and works it way up to overnight excursions outside Havana – all peer suggested and updated weekly based upon returning traveler reports. YOU DO CUBA in a modern air-conditioned tour coach with a fulltime professional chauffeur from arrival to departure. Havana is one of the oldest and most architecturally stunning cities in the New World. During your many excursions around the capital, and beyond, your guide provides ongoing historical commentary for all points of interest. We want you to learn everything about our beautiful island. Several site highlights are Modern Havana, the Capitol building, the Grand Theatre, Central Park, Prado promenade, Plaza de la Revolución, Coppelia Ice Cream Park, Plaza José Martí (in front of U.S. Interests Section), Malecón seawall, Monument to the Battleship Maine, Hotel Nacional, University of Havana, Cementerio de Cristóbal Colón, and the Miramar, Central Havana and Vedado neighborhoods. Ornate filigree and statuary adorn Havana's Gran Teatro where the National Ballet performs. Click photo for view of interior. Learn to say: Un mojito por favor! Arrival at Havana's José Martí International Airport. Collect your bags and go through customs. You're welcomed at the airport lobby by your Cuba Education Tours guide and professional bus chauffeur. Hotel check-in with assistance from your guide. This is a good time to exchange some money into Cuban Convertible Pesos. Upon arrival, enjoy a welcome drink with tourmates, hotel staff and your guide. Free time to settle in to your hotel room and freshen up. Group welcome dinner with your guide and tourmates. Participants arriving on non-Cubana de Aviación flights who might miss this dinner are given a voucher for a hotel dinner to be used at any time over the course of the tour. Your guide will keep you posted on entertainment options around the city. The city of Havana as seen from the El Morro castle and San Carlos de la Cabaña fortress, across the harbor from your hotel. Lay of the land Morning visit to the Maqueta de La Habana Vieja [Scale Model of Old Havana] to learn about this community and its development plans. It's a 1:500 scale model of Old Havana complete with an authentic soundtrack meant to replicate a day in the life of the city. It's incredibly detailed and provides an excellent way of geographically acquainting yourself with the city’s original core. Cathedral Square, the most beautiful and private 18th century colonial plaza on the island. Named after the masterpiece of Cuban baroque architecture: the Catedral de San Cristóbal de la Habana built by the Jesuit order. Palacio de los Capitanes Generales, former seat of colonial government. Today the building houses the Museum of the City. Palacio del Segundo Cabo [Palace of the Second Lieutenant] dates from 1770. Today it houses the Instituto Cubano del Libro [Cuban Book Institute] and the Galería Raúl Martínez (famed poster artist). Museo de Artesanía at Castillo de la Real Fuerza, the oldest remaining fortress built by the Spaniards in the West Indies. We continue onto San Francisco Square, one of the oldest plazas in the historical quarter. The square is named after magnificent Iglesia y Monasterio de San Francisco de Asís dating from the 16th century. The basilica is a striking example of Cuba baroque architecture. And later to Plaza Vieja, the only civic square of colonial times. Absent are churches and government buildings, and is in contrast surrounded by opulent aristocratic 17th century residences. Here we'll visit an important center for the visual arts. Group welcome lunch at the ever-popular Café La Mina. Situated in a former girls' school from the 17th century, the building housing La Mina graces a scenic corner of Plaza de Armas [Square of Arms], Havana's oldest public space. The atmosphere is authentically Cuban as is its menu. Three dining areas face a central courtyard filled with ferns, trees and exotic birds. La Mina serves up excellent Daiquiris and Mojitos. There's a tempting heladería [ice-cream parlor] attached. Yum. The menu includes typical Cuban cuisine specialties, served in a typical Cuban atmosphere. You can choose among chicken, pork and prawns cooked in a variety of ways. The dish of the house is the combo Caribeña La Mina, which is a sauté of chunks of chicken, pork, and shrimp in a tasty sauce with a hint of rum, and comes with a mojito cocktail, black beans and white rice, roasted pork with Cuban flavor, and dessert. The restaurant has a central courtyard, rich in exotic plants. Ernest Hemingway called Havana the Paris of the Americas. Centro Cultural Antiguos Almacenes de Depósito San José arts and crafts market. Afterwards we'll visit the Centro Cultural Antiguos Almacenes de Depósito San José. This marvelous new restoration of an old dock warehouse has resulted in a gigantic market exhibiting the wares of hundreds of Cuban artists and craftspersons. You'll find thousands of souvenirs, beautiful paintings, photographic prints, guayaberas (traditional Cuban shirt), woodwork, leather items, jewelry, painted ceramics and handcrafted cigar boxes, to name a few of the many authentic items for sale. The market also hosts food and beverage venues, money exchange facilities, public toilets and telephones. Return to your hotel and freshen up. Now for a special group dinner at Restaurante La Divina Pastora. This seafood palace sets just behind the big cannons below Fortress of San Carlos de la Cabaña where Che Guevara established his headquarters after the Revolution came to power in 1959 – four hundred years after it was built on the backs of African slaves and endentured European laborers. La Divina is noted for its cocktails, good service and live music. You'll eat near the water on the north side of Havana Harbor overlooking Old Havana to the south. Tour highlight We witness a most dramatic ceremony – El Cañonazo – the Firing of the 9PM Cannon at the Fortress of San Carlos de la Cabaña. This enchanting colonial reenactment dates back to 1519 when the city of Havana was enclosed by a tall thick rock wall to ward off attacks from pirates and the English. The cannon firing signaled the closing of the city gates for the night. If you were outside at the time, you were in "vedado" or the forbidden zone. Today Vedado is an important cultural hub and beautiful section of modern Havana. Once completely deforested as a result of charcoal production for coffee processing, and mired in poverty, Las Terrazas today is a self-sustaining eco-community. Heavenly pool at Las Terrazas. Morning departure to Las Terrazas eco-community in the Sierra del Rosario mountain range spanning the provinces of Artemisa and Pinar del Río. We'll tour the rural village called Rancho Curujey and enjoy a welcome cocktail while learning about this self-sustaining community's successes in reforestation, historical preservation, environmental balance, and a good life. Next, we'll meet with local artists and craft workers in their homes and studios. We'll visit a local school and talk with its teachers and students. Later we'll walk the incredible ruins of a French Coffee Plantation built in 1801 worked by African slaves. We have lunch at an open-air restaurant specializing in traditional country cuisine – La Casa del Campesino – ever popular with tour participants. You'll have free time to swim in the fresh waters of the Río San Juan and explore the surroundings of this lush tropical paradise. Don't forget your swimming suit. We'll meet the environmental scientists and technicians responsible for the restoration of the jungles and forests of Las Terrazas. We'll learn the principles, approaches and practices that combined serve to sustain the region. Set within a beautiful colonial mansion, El Santo Ángel Restaurante enjoys the enchanted atmosphere of Plaza Vieja. Its stately inner courtyard is lined with plants to which many birds flock. 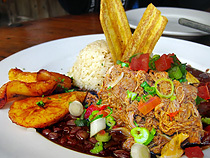 Its menu features nueva Cubana cuisine and superb international dishes. There is always fab live music to accompany your meal. Learn to cook nueva Cubana cuisine. Tour highlight Tonight you'll learn the secrets of nueva Cubana cuisine from the master chef and food staff at El Santo Ángel Restaurante. You'll watch the chef ready your dinner in the privacy of the restaurant's kitchen. You'll be led through each step in the preparation of your entrée and side dishes. This is a rare chance to learn unique Cuban techniques and methods – and bring them home to your family to enjoy. Learn more about the basics of Cuban cuisine. Tour highlight 9:00 PM Noche de fiesta cubana – a special welcome party organized by Cubans for tour participants! Tonight we feature performance by the Afrocuban Grupo Dulce María. It's a great opportunity to meet new people, make new friends and dance to Salsa, Son, Rumba, Mambo and other popular island rhythms. Many staples are grown organically in Cuba: Bananas, coffee, cucumbers, pineapple, sweet potatoes, eggplant, and avocados. Restoration of the Convent of Our Lady of Belén began in 1991 and continues today. It serves as a public health facility for the elderly in the neighborhood and a permanent residence for 50 retirees. Eventually a section of the facility will house a small hotel. Visit to the Convento de Nuestra Señora de Belén [Convent of Our Lady of Belén], a humanitarian health project in Old Havana. Construction on the Convent was begun in 1712. It was expanded and remodeled several times over the centuries. Finally abandoned in 1925, it fell into grave disrepair. In 1991 restoration began and continues with amazing results. Today the Office of the Historian, local Public Health authorities and the Order of the Sisters of Charity jointly manage the Belén Convent. It is home to fifty elderly people and provides physiotherapy and ophthalmological services to many more elderly in the community. Other activities include exercise classes, board games, cognitive rehabilitation, films, crafts workshops, and "love among the elderly" lectures. We'll meet with project Director Nelson Águila and tour the facility. Tour highlight We'll feast on a delicious lunch hosted by José Rodríguez Fúster, one of Cuba's most important ceramists and painters, at his whimsical studio in Jaimanitas, just outside of Havana. 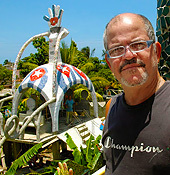 Fúster is known as the Picasso of the Caribbean and his art is acclaimed internationally. His artistic mission has been the rehabilitation and decoration of the village of Jaimanitas where he lives. Fúster has decorated over 80 houses with ornate murals and domes to suit the personality of his neighbors. Nowadays, Fúster's art is a cherished part of Cuban culture and joins the rank of other public artworks such as that of Gaudi in Barcelona or that of Brancusi in the Romanian city of Targu Jiu. He support's his community project by the sale of his paintings and ceramics. Return to your hotel and freshen up. The balance of the day is free for you to explore the sights and sounds of the city. This evening you are free to explore stellar eateries. Tour participants receive a guide featuring Havana's best restaurants for every taste and budget. It includes both paladares [small private diners] and fabulous state owned joints run by acclaimed Cuban chefs. Entertainment suggestions Shake your booty to the best Afrojazz, Cubajazz and Sonjazz at Club La Zorra y El Cuervo [The Fox and the Raven] featuring astonishing performances by island bands. It's a popular haunt for Cubans and foreign guests. Or, enjoy a light dinner and evening of music at the Jazz Café. It's a popular modern jazz supper club with chrome trimmed tables and fairly bright lighting located on the Malecón seawall in the Galerías de Paseo shopping center. At night the venue swings into action with live jazz, timba and, occasionally, straight-up salsa. It attracts plenty of big-name acts. Youths and fishers on the Malecón at sunset in front of your hotel. War reporter, activist, man of letters, journalist and literary titan Ernest Hemingway. This morning we're off to visit Finca Vigía [Lookout Farm] where North America's literary giant Ernest Hemingway spent twenty-one of his most important and productive years penning building blocks of English literature. Claimed by both the United States and Cuba as their son, it was Hemingway himself who declared the island his true home. The house has been preserved just as it was when Hemingway lived there. You'll see his personal objects, thousands of books and photographs, as well as some "trophies" bagged on his frequent safaris. In preparation for this afternoon's activity, watch this riveting British Broadcasting Corporation feature from Around the World in 80 Gardens on urban organic farms in Havana including a walk-through of Vivero Organopónico Alamar by fab host Monty Don. We'll visit the UBPC Vivero Organopónico Alamar, 15 km (9.3 miles) east of Havana. It's one of the most successful urban organic farms in Cuba raising ornamental plants, medicinal herbs, and millions of seedlings for neighboring residential and collective farms. Established in the early 1990s, the Alamar cooperative has over 20 members and provides a range of healthy, organic vegetables to the community. Eggshells are affixed to tips of medicinal aloe vera plant to thwart bird attack. Produce is raised employing the practice of permaculture: no chemical fertilizers and pesticides. Instead, natural biological methods are used to nourish the soil, frustrate pests and conserve water. The result is an increased rate of yield and reduced costs. We'll have lunch at Hemingway's favorite bar and diner La Terraza. Our suggestion is a glass of ice cold "Cristal" cerveza, or lemonade, and camarones al ajillo [garlic shrimp] fried in olive oil, and seasoned with garlic and parsley – delicious! The young boy in the novel "Old Man and the Sea," Manolin, was based on the young son of the original owner of La Terraza, Manolito. Next we'll visit Cojímar, a small costal fishing village northeast of Havana where Ernest Hemingway kept his boat during the decades he lived in Cuba. Cojímar was the inspiration for Ernest Hemingway's The Old Man and the Sea. JAZZ FESTIVAL OPENING CEREMONIES We're off by coach to the big event! Tonight you'll experience the incredible sounds and melodies of world jazz greats. You'll be part of a tradition that has spanned three decades and provided a launching pad for young musicians who've gone on to fame and notoriety. Cameras and videos are welcomed to capture memories of this grand occasion. Morning visit to the Casa de África. Established in 1986, this museum and cultural center is located in an old tobacco warehouse in Habana Vieja. It focuses on the continent of Africa and Cuba's African heritage, reflecting in a simple, but deep way, history, religions, art, wisdom, and emancipation battles. The Casa de África is devoted to research and the promotion of African culture and how it has shaped and defined Cuban culture. The Casa conducts workshops for youth, hosts theoretical events, special exhibits, and music and dance performances. Cuba claims both Africa and Europe as its mother continents. The museum reflects the traditions, customs and celebrations comprising the ancestral wealth of Africa for the enjoyment and knowledge of new generations. Fernando Ortíz, master Cuban ethnographer. Gallery collections include initiation and fecundity masks, big wooden sculptures carved, wardrobes, musical instruments, and paintings. It also holds a vast library for use by academicians, researchers and university students interested in acquiring knowledge of the African culture. Among the most significant objects is the library of Fernando Ortíz, master Cuban ethnographer. Restaurant Bar La Imprenta is a fabulous new eatery in Havana that's getting rave reviews for its menu and décor. Set within a gorgeous building that once housed the printing press for a major 19th century publisher of La Habanera magazine. Old bits of printing equipment serve as decoration in the new bar. The restaurant offers a wide variety of cocktails and beverages in addition to light snacks and grilled meats and delicious seafood. Next we'll cross Havana harbor to the Municipality of Regla. This Afrocuban community has a long, rich and still active tradition of African-inspired religions. We'll visit Regla's church dedicated to the black "Virgen de Regla" Yemayá, the African goddess of the sea in the Yoruba religion and the patron saint of sailors. We'll tour the Museo Municipal de Regla and learn of the origins of this unique community and its Afrocuban cultures. Exclusive dance presentation While in this vibrant Afrocuban community, we'll be honored by a private performance of Conjunto Folklórico de Regla. Jazz Festival Performances You're off to imbibe in stellar musical events. Tonight you'll experience the incredible sounds and rhythms of world jazz greats. Pick your venue and hope into a taxi to celebrate. Group transportation is not provided this evening as there are too many different activities. A taxi only costs between three and four Cuban Convertible Pesos. Performers at the notorious Tropicana Cabaret. Scenes from an Afrocuban dance performance in Havana. Photos Barbara Fudge. Morning and afternoon is your freedom to explore time. You're at the beck and call of the magic that is Cuba, its people and their incredible culture. Let's get started! Baby sea turtle. Cuba protects its coastlines from exploitation of marine life. Beach Trip! Oh wow. How about a day excursion to the sugar white sand beaches of Playas del este [Eastern beaches] just twelve miles outside the metropolis? Ever popular with Cubans, and lacking foreign tourists, the Playas del este rival the best seaside destinations in the Caribbean. While there you'll have plenty of time to snorkel, explore surrounding nature and make new Cuban friends. Don't forget your swimwear and sunscreen; el sol shines stronger on the island. This is one of many exciting excursions that can be arranged at the tourist desk in your hotel. Afrocubanismo Many years ago Fidel Castro declared Cuba as an African Spanish nation. African influences permeate everything: food, music, architecture, art, dance, you name it. Cuba is a celebration of color and a fresh healthy take on race and human relations. Cubans come in every color, and they are proud of it. Guanabacoa is a community in eastern Havana. It's famous for the practice of the Santería religion. Your activities guide gives directions. Nature at its best Lush tropical vegetation abounds in and around Havana. This city is dotted with urban organic gardens (which contribute to nearly half of fresh produce consumed). Nature trails line the main river Almendares. The Parque Metropolitano is a wonder to behold. Outside the city is the bountiful Botanical Gardens, home to thousands of tropical specimens. Natural highlights are detailed in your activities planning guide. Dance and music Hot throbbing Latin rhythms greet visitors at nearly every corner and restaurant. Havana hosts dozens of happening night spots with tunes ranging from Salsa, Son, Rumba, Mambo, Merengue, Samba, Tango, Jazz, Hip Hop, Rueda, Reggaeton and much more. And at every venue you can dance into the wee hours of the morning! Your activities planning guide lists them all. Today you can revel on the beach. Enjoy the sugar white sand and warm crystal clear waters of the Caribbean. You deserve it! One-in-ten autos in Havana are pre-1959. Many are in top-notch condition. Some are for hire. Striking 15 meter (49 foot) mosaic tile mural at the entrance of Museo Bellas Artes. Island artist Víctor Manuel's Gitana Tropical, known as the Cuban Mona Lisa, was painted in Paris in 1929. Followed by a private guided tour of the Palacio de Bellas Artes [Palace of Fine Arts] dedicated exclusively to housing Cuban art spanning three centuries. Sections are devoted to landscape, religious subjects and narrative scenes of Cuban life. A gallery devoted to the 1970s displays the latest generation of Cuban artists whose works reflect the strong symbolic imagery prevalent in recent decades. Together the exhibits account for the richness of the island's Spanish, French, Chinese, African and Aboriginal cultural roots. Notable works include those of René Portocarrero and Wilfredo Lam. We'll visit the Callejón de Hamel, an alley where all the buildings display murals inspired by Afrocuban culture and religions. While there we'll take in an incredible rumba performance enjoyed by the community every Sunday. Troubadour at Callejón de Hamel, a micro-community of Afrocuban musicians and muralists. The balance of the afternoon is free for you to explore the city on your own or with you tourmates. Tour highlight Farewell group dinner at the popular Restaurante El Patio. Located in the Cathedral Square, El Patio is housed in a beautiful 18th century residence, the former Palace of "Marqués de Aguas Claras." Its advantageous position provides a splendid panorama of the stunning historic surroundings. It also has an inside court and one terrace overlooking the famous Plaza de la Cathedral. Construction began in 1751 and ended in 1755. The house is considered one of the most interesting architectural structures of its era. El Patio's menu will please the most diverse tastes. It offers stellar service and tasty Cuban and international cuisine. Expect the very best musicians at the closing ceremonies of the Havana International Jazz Festival. JAZZ FESTIVAL CLOSING CEREMONIES We're off by coach to final event of the 28th Havana International Jazz Festival! We travel from the restaurant to the venue of the ceremony. Transfer to Havana's José Martí International Airport for your return home. Don't forget to save 25.00 CUC for your Cuban airport departure fee and some money for meals on the airplane and while in transit home. Want to stay longer in Cuba following your tour? Contact us and we will help make it happen at a price you can afford.